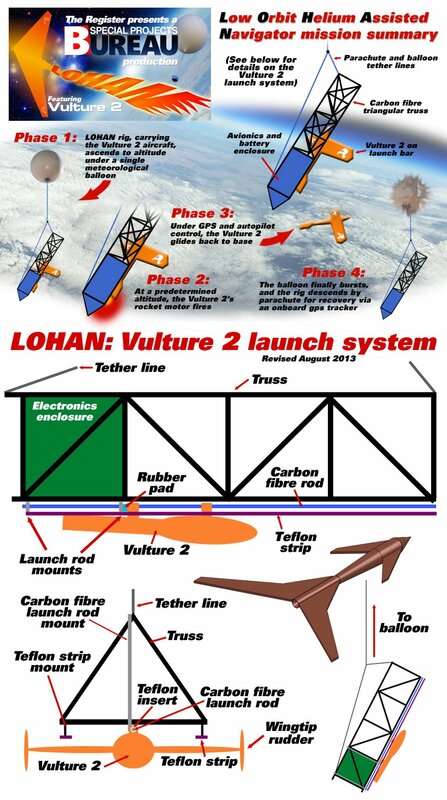 In September last year, the Low Orbit Helium Assisted Navigator (LOHAN) team wrapped a successful Kickstarter campaign to take the launch of our Vulture 2 rocket-powered spaceplane to the US of A. As long-term readers know, this tin-rattling was prompted by a quite remarkable series of events - involving the attempted import into Europe of the aircraft's Cesaroni P54-3G J140-P White Longburn reload - which grounded our planned launch in Spain. This apparently simple operation was scuppered by a two-pronged attack involving the European Union - which for some reason failed to certify the reloads for import - and a very rude man from Spain's Ministry of Obstruction, who declined to sign the necessary paperwork on the grounds that handling off-the-shelf ammonium perchlorate composite propellant (APCP) motors required ownership of an explosives factory. Comedy gold, although we didn't find it particularly amusing at the time. Fired with indignation, we immediately put out feelers to Spaceport America in New Mexico, the future home of Virgin Galactic launches. As we reported back then, the facility "told us that in principle the mission is go", although we would still require a Federal Aviation Administration (FAA) waiver "even for a facility specifically dedicated to such shenanigans". Spaceport America boasts "brand new FAA-licensed horizontal and vertical launch areas" plus "6,000 square miles of protected airspace", specifically FAA Special Use Airspace Restricted Areas 5111A and 5111B. You'd assume, therefore that an FAA waiver for what is effectively a simple rockoon launch would be a breeze. With the benefit of hindsight, we should have applied to build that explosives factory*. Spaceport America initially agreed to lend a hand with the FAA - for a price. It then apparently decided against that, and simply put us in touch with the local liaison at the FAA's Albuquerque tentacle. He in turn informed us he'd passed the paperwork up the chain of command, and at this point began what we have dubbed "the long silence". All subsequent attempts to prise information from the FAA via Albuquerque have met with silence. Iain Thomson from El Reg's San Francisco office has done sterling work on this front, to no avail. Iain has also been dealing with Spaceport America, which is similarly reluctant to talk. He even asked the office of New Mexico Congressman Steve Pearce if it could intervene on our behalf, which it agreed to do. We're still awaiting news as to whether Mr Pearce can persuade the taxpayer-funded facility to pull its finger out. While the spaceport is making moves to diversify its operations, doubts remain about its long-term survival. It was established as a dedicated facility for Virgin Galactic operations, and nobody knows quite when these will kick off. Assembly of the second SpaceShipTwo is now structurally complete and Virgin Galactic expects to roll the finished vehicle out for the first time and continue the test programme later this year. Commercial service will start once the vehicles are thoroughly tested and when the experienced and talented team is content that all risks are fully understood and can be managed safely. Hmmmm. Given the uncertainty surrounding Virgin Galactic, you'd image that Spaceport America (in its own words "committed to the spirit of exploration, the promise of human potential, and the powerful combination of vision and courage") would be delighted to host what promises to be an entertaining and high-profile mission such as LOHAN. Mind you, it does have other cards up its sleeve. It recently inked a deal with ARCA Space Corporation - originally a Romanian space outfit which has now established itself in Las Cruces, New Mexico. ARCA's operations at the spaceport will include testing of the AirStrato UAS - "an electrical powered aircraft able to fly almost twice as high as a commercial airliner". Good luck getting clearance for that, chaps. In the end, we acknowledge that to a certain degree we have been victims of bad timing, as the FAA deals with mounting hysteria over uncontrolled drone swarms filling US skies, and attempts to throw together some new legislation to cover the UAV boom. Readers will be aware that it was only after e-commerce monolith Amazon threw a strop and took flight testing for its proposed drone delivery service off to Canada did the FAA finally grant it permission for US operations. LOHAN is unusual in that it is the first rockoon UAV mission, but hardly represents a concept so radical that it requires 12 months to consider. The project has sucked up years of work - much of it by unpaid volunteers - and it's a pretty poor state of affairs when a public, transparent and open source project is needlessly impeded. So, what's our next move? Well, it's not quite all doom and gloom. As we watch administrative tumble-weed crawl in slow motion across the New Mexico landscape, our magnificent US allies at Edge Research Laboratory are working on an alternative plan to launch from their own private airport base in Colorado. They've actually been working on this for quite some time, and have now got a full proposal to the airspace managers in Colorado. They told us yesterday: "A meeting is imminent, and we'll report back as soon as the situation develops." *I can thoroughly recommend the enlightening read "So, you're thinking of opening an explosives factory?" This document begins: "In order to establish an explosives manufacturing facility in Spain you will need to complete the following obligatory application:" There is then a 2,735-page form, to be presented in triplicate at the Ministry of Obstruction, each page individually stamped and signed by your local mayor, the Chamber of Commerce, an officer of the Guardia Civil and two doctors, and accompanied by a photo of yourself (no hat or glasses) holding a fire extinguisher. Bear in mind, this is only the application for an application, and once ministry's approved your initial submission, it will then send the actual 12,862-page application form. **Special thanks to Vulture Central's Miatta Momoh in our London tentacle, who's been dealing with the Vulture 2 (currently sitting in Denver), and the ATA carnet we used to get it into the US.